Colds and sinus infections originate from airborne virus and bacteria that lodge in the warm, moist mucous membranes of the nasal and sinus passages. These pathogens form colonies there that can double in size every 20 minutes! Confined areas such as offices and airplanes are filled with airborne pathogens. If the infection is not terminated, the delicate nasal and sinus membranes can become completely inflamed, resulting in a serious head cold or sinus infection. Cold Rescue is great as a preventative, so keep one in your pocket, purse, or desk drawer! Purified Water and Ionic Silver > 20 ppm. Xanadu's number one seller during cold season! This product quiets cough with a natural expectorant. Support the immune system and help to abate the uncomfortable symptoms of the flu. Most sinus infections originate from airborne virus and bacteria that lodge in the warm, moist mucous membranes of the nasal and sinus passages. They form in colonies there that can double in size every 20 minutes! If the infection is not terminated, the delicate sinus membranes become completely inflamed, resulting in a painful condition. Purified Water and Ionic Silver > 30 ppm. 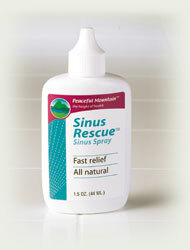 Promote healthy sinus function and relieve sinus congestion.